MusAicMkII - The Android smartphone app that creates a never ending stream of free music, using Artificial Intelligence (AI). MusAicMkII has three views that you navigate between by pressing the Tabs at the top. The first, "Play View" has a set of buttons that work as ordinary music player control buttons. To save working memory on your phone, the "Play Previous" button will remember only one song back. At the top of the view, you will also find the "Rating" gauge. Turn the knob below the gauge, to change its value. More on rating and "Composers" below. 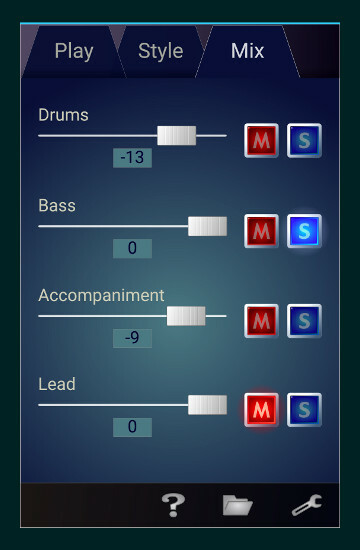 In "Style View", you decide in which style the music will be composed. The styles range from simple rythmic patterns over more and more complex harmonies, to full 12 tone tonality (all the tones on the piano). 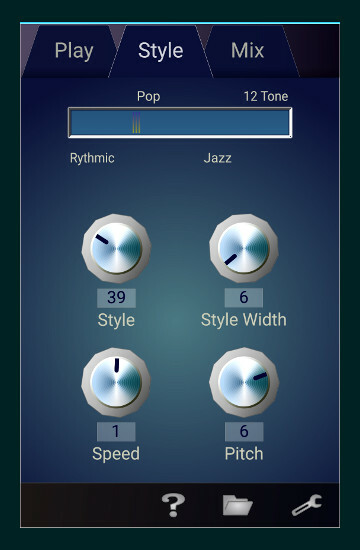 Turning the knob "Style" changes the style of the music, while "Style Width" sets the width of the selection, so that with a high style width value, style selections may be in a larger range, e g both Pop and Jazz. The style settings resulting from the values of "Style" and "Style Width" are shown on the Style Meter in the top of the view. Changing the position of the "Speed" knob will alter the tempo of the song being played. Turn the "Pitch" knob to change the key of the song up or down. In the"Mix View" you can change the volume levels of the different instruments by changing the positions of the volume knobs. You can also turn the instruments on and off in different ways, by pressing the "Mute" (M) and "Solo" (S) buttons. The "Composer" menu has options to "Save Composer", "Load Composer" and "Merge Composer". A Composer is a combination of musical parameters and the amounted ratings given to the different songs played. 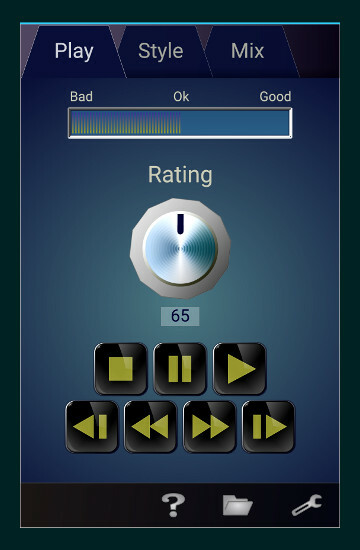 The rating value is used by the Composer to learn your musical taste, so that for each new song composed, the result will be more and more to your liking. All you have to do is set the "Rating" value once for every new song you hear. After enough learning time, each Composer will have its own distinctive character, so you can build yourself a collection of favourite Composers, by saving them now and then. Should you find that a Composer is getting a bit too much of its own character, just load the "Default" Composer to start anew. Moreover, Composers can be combined by "Merging": Just select "Merge Composer" from the menu and choose a Composer, other than the one that's currently loaded. The resulting "offspring" will be a combination of the two original Composers. Merging works best if both Composers have a high rating. At the bottom of each Tab, you'll find three menu symbols. Pressing any of them let's you perform different tasks or change various aspects of how MusAicMkII works. ● Pressing the Question Mark symbol, let's you view the Help and About texts. ● Pressing the "Folder" symbol opens a menu that will let you work with Songs and Composers. In "Songs" you can save the current song if you find it pleasing, then load it later to hear it again, or select delete to remove any saved song. When saving a song, the settings of the mixer in the Mix View will also be saved. "Save Hit Song" saves both the current song and a high rated Composer with the same name, that you can use to create more songs, resembling the original one. "Export Song" lets you save the current song as a MIDI-file in your phones "Music" directory. From there you can open it in other applications (DAW:s, like Reaper, Cubase, Logic etc. )to edit it in any way you like. You can also use the saved MIDI-file as a ringtone on you phone. Please refer to the phones' manual if you don't know how to do this. Note that when you're playing saved MIDI-files outside of MusAicMkII, the sounds used for the various instrumens will be different, since you will be using you phones' internal MIDI synth. ● Press the "Wrench" symbol to open the Settings menu. In "Sound Profile" you can set the overall sound of MusAicMkII, add or remove extra Treble/Bass, or if you experience the sound as diffuse and distorted - try turning off "Volume Boost". The three different settings in "Humanizing", let's you decide whether the music should be played machine-like and perfect, or with a more human feel. Setting "Song Length" to "Full" makes MusAicMkII compose full length songs instead of short snippets, as when "Short" is selected. Don't forget to check out the FAQ and Tips & Tricks pages for more info! Click the links on top of the page to learn more.